The development of DNA-sequencing technology and the advancement of computer-assisted sequence analysis have provided a powerful means of determining the genetic content of baculovirus genomes and investigating their gene organization and evolution. The entire nucleotide sequence of three baculovirus genomes are now available (Ahrens et al., 1997; Ayres et al., 1994; Maeda, 1994). Two of these genomes, those of Autographa californica nuclear polyhedrosis virus (AcMNPV) and Bombyx mori nuclear polyhedrosis virus (BmNPV), are closely related, whereas the third sequenced genome, that of Orgyia pseudotsugata nuclear polyhedrosis virus (OpMNPV), is more distantly related. Comparison of the overall gene content of divergent baculovirus genomes provides an initial view of what genes are retained in all genomes, and thus are likely to be fundamental for virus survival. 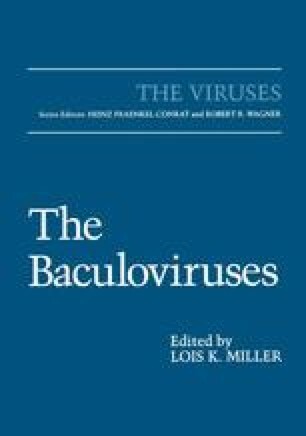 Such genes constitute the “essence” of being a baculovirus, i.e., the minimal basis of membership in the baculovirus family, and are likely to provide insight into the ancient origins of this viral family. In contrast, characterization of the genes that are found in only some members of the family provide novelty to the virus and will influence individual phenotypic traits such as host or tissue tropism, virulence, and morphology [e.g., nuclear polyhedrosis viruses (NPVs) vs. granulosis viruses (GVs)]. The nature of these “individualistic” genes will probably reveal how baculoviruses are currently changing and acquiring new, distinctive properties. This chapter focuses on a comparison of the AcMNPV and OpMNPV genomes and highlights some of the fundamental as well as unique properties of these viruses.